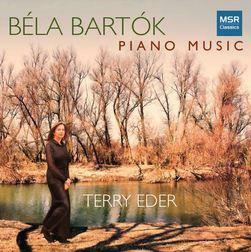 MSR Classics www.msrcd.com has just released Terry Eder’s new recording of piano works by Bela Bartók (1881-1945) ranging from his early Op.6 Bagatelles to Six Dances in Bulgarian Rhythm from Mikrokosmos. It is with the Fourteen Bagatelles, Op. 6, SZ.38 (1908; Rev. 1945) that Terry Eder opens her recital. Bagatelle No.1: Molto sostenuto has a well laid out, thoughtful opening with Bartok’s subtle dissonances creeping in before bringing well controlled tempi and dynamics in Bagatelle No. 2: Allegro giocoso.Bagatelle No. 3: Andante has a fine flow as a repeated rippling motif is overlaid by the melody whereas Bagatelle No. 4: Grave brings broad, firm chords before leading to a more thoughtful moment with the firm chords still occasionally appearing, together with discords. There is a light, nicely sprung Bagatelle No. 5: Vivo and a Bagatelle No. 6: Lento to which this pianist brings a restrained melancholy depth. She handles the varying tempi Bagatelle No. 7: Allegretto molto capriccioso beautifully with lovely phrasing and a lovely touch in the coda. Bagatelle No. 8: Andante sostenuto again has the phrasing and subtle little dissonances beautifully done. There are some fine rhythmic phrases in the Bagatelle No. 9: Allegretto grazioso to which Eder brings a lovely light touch before a fast Bagatelle No.10: Allegro with its constantly changing tempi and rhythms expertly handled here and leading to a very fine complex passage before the coda. Eder finds the elusive nature of Bagatelle No.11: Allegretto molto rubato and brings a real sensitivity to the subtly constructedBagatelle No.12: Rubato with a beautifully light touch to the little rising and falling scales - a remarkably beautiful piece. She develops Bagatelle No.13: ‘Elle est morte’: Lento funebre beautifully, bringing some lovely harmonies before a very fine, concluding Bagatelle No.14: Valse ‘Ma mie qui danse’: Presto bringing terrific fluency to all the varying rhythms and tempi with a great coda. The Two Romanian Dances, Op. 8/a, SZ.43 (1910) already show a further advance in Bartok’s style. Eder brings a fine sense of slowly developing rhythmic drive to the Romanian Dance No. 1: Allegro Vivace, so restrained, building again from the slow section through some fine, intense passages. The Romanian Dance No. 2: Poco allegro is wonderfully skittish, this pianist providing great phrasing as it moves through its varying tempi and dissonances, rising through some formidable passages played with terrific strength and clarity before the declamatory coda. Moving forward, we come to the Fifteen Hungarian Peasant Songs, SZ.71 (1914-1918). They date from the war years. Bartok was rejected for military service and, in 1915, was collecting folksongs in Slovakia. This set of Hungarian Peasant Songs starts with Four Old Sorrowful Songs, firstly a beautifully expansive Rubato before a slow finely measured Andante where Eder conjures a real sense of sadness with some lovely subtle dissonances. Poco rubato is beautifully phrased and paced, bringing an intense melancholy that is picked up in the in the Andante. Two other pieces follow, a lithe and rhythmic Scherzo (Allegro) with Eder bringing some fine textures andBallade (Tema con variazioni) where she brings dramatic chords soon contrasted by a gentler section where she creates a lovely gentle melancholy together with some fine textures and sonorities before building some fine passages that lead to the coda. The rest of the Hungarian Peasant Songs consist of nine Old Dance Tunes, Allegro bringing a typically spiky Bartok opening before this pianist leads us through some really fine passages. The Allegretto seems to pick up on the spiky rhythmic motif of the preceding piece, developing it into a quieter variation.Allegretto has an insistent rhythmic theme before the gentler opening of L’istesso tempo that soon develops a harder edge. Assai moderato brings some beutifully fluent chords, an expansiveness that is lovely before a fleeting light, rhythmic Allegretto that quietly fades at the end. Eder gives a light fluent rhythmic lift to Poco più vivo – Allegretto before a faster Allegro that has beautifully controlled tempi. The Allegro - Più vivo - Poco più meno vivo makes a terrific conclusion with Eder highlighting the insistent rhythmic lines, bringing fine fluency as she moves quickly to the coda. The Improvisations on Hungarian Peasant Songs, Op. 20, SZ.74 (1920, corrected by Peter Bartók 2002) open with a slow, sad Molto moderato to which Eder brings much pathos. The tempo picks up with the Molto capriccioso with some terrific dissonances and rhythmic variations caught so well by this pianist. There is a quizzical little opening to Lento, rubato with this pianist allowing it to develop freely before the Allegretto scherzando, to which she brings a fine rhythmic litheness. Allegro molto brings a faster dance with an insistent motif in this very fine performance, particularly in the more complex passages, rhythmically and harmonically. There are strange faltering phrases to Allegro moderato, molto capriccioso before its sudden end. Eder brings a real beauty to the slowly unfolding Sostenuto, rubato before concluding the set with a nicely sprung Allegro, full of rhythmic subtleties. It was Bartok’s son Peter, whose name appears above as making corrections to his father’s Hungarian Peasant Songs, who provided the stimulus to write Mikrokosmos (1926, 1932-39) a collection of 153 piano pieces in six volumes. They range from the relatively simple through to the most virtuosic, thereby covering all abilities. Terry Eder takes Six Dances in Bulgarian Rhythm from the sixth and final volume of Mikrokosmos, SZ.107 containing some of the most complex and difficult pieces. Mikrokosmos No.148 is fast flowing, complex and dissonant, beautifully phrased by Eder. Mikrokosmos No.149 is fast and furious rhythmic with this pianist bringing a terrific bounce and forward momentum. The expansive yet rhythmically dancing Mikrokosmos No.150 is full of subtle shifting harmonies, beautifully brought to life here beforeMikrokosmos No.151 brings a lovely little tune that flows rapidly forward with a lovely flow, wonderfully phrased. Mikrokosmos No.152 is another fast flowing piece with varying rhythms and tempi, very finely done. A richly textured, fast and rhythmic Mikrokosmos No.153 ends this selection. Eder brings a terrific flow making this a fine conclusion to this recital. Terry Eder brings a fine fluency but above all rhythmic flexibility to this music. It is quite clear that she has thoroughly absorbed Bartok’s idiom making these performances very fine indeed. She is well recorded at the Recital Hall of the Performing Arts Center, Purchase College, State University of New York, USA. There are excellent notes from the pianist. The American pianist, scholar, and educator Terry Eder is a Bartók specialist. Her expertise stems in part from studies and collaborations with various Hungarian pianists, including Zoltán Kocsis, arguably the greatest Bartók pianist around. Put to the test in this new recording, Eder’s affinity for Bartók yields considerable dividends. Throughout her recital, which imaginatively mixes known and comparatively obscure works, Eder displays a stylish mastery of Bartok’s idiomatic writing, as well as the technical acumen required to negotiate the virtuoso hurdles posed by many of these scores. Terry Eder, Detroit native, world traveler and piano competition winner, seems to be making a specialty of Hungarian music. If the present release of piano music by Béla Bartók is any indication, she has a real feeling for the sadness, passion, and joy in the soul of that people. Bartók, who was himself a very accomplished pianist and teacher (he numbered among his pupils the great Annie Fischer), would have been proud to acknowledge the tribute Eder pays him in this recital. Eder shows a keen awareness of the vital rhythms and predominant moods (often subject to volatility) in each of the 45 short pieces in this recital. Her strong left hand allows her to explore the rich, deep bass of the wide-ranging 15 Hungarian Peasant Songs, Sz.71; 8 Improvisations on Hungarian Peasant Songs, Sz.74; and 6 Dances in Bulgarian Rhythm, Sz.107. The Hungarian Peasant Songs are divided into two contrasted sections, entitled “Old Sorrowful Songs” and “Old Dance Tunes.” Eder is good at capturing the spontaneous, improvisatory nature of the songs, many of which are quite melancholy and require lots of rubato, and the generally extroverted character of the dance tunes. A keen ear for harmony is the key to interpreting the 8 Improvisations, which include pentatonic scales and polytonal harmonies, plus a subtle use of counterpoint. The pieces range in mood from sadly contemplative to raucous with an occasional hint of sarcasm, and in texture from hazy mist to full-blooded octaves in both hands. As the title implies, Rhythm with a capital “R” is the name of the game in the 6 Dances in Bulgarian Rhythm. They involve constantly changing time and pitch intervals and unit groupings that keep Eders fingers continually alert. The 2 Romanian Dances, among the most popular of Bartók's minor works and often heard in transcription for string orchestra, come across as beautifully self-contained miniatures, much as Enescu was to create in his Romanian Rhapsodies. They range in mood from quiet tremolos in the bass to an increasingly frenzied crescendo in Dance No. 1, while humor and severity are at odds in No. 2, a scherzo-like dance whose volatility defies easy classification. The 14 Bagatelles. Sz.38 are so intriguing in their variety of mood and treatment that they easily give the lie to their name, which signifies an easily-dismissed trifle. On the contrary, they reminded me of Chopin's Preludes in that they are truly the “beginnings” of larger matters that often end tantalizingly on the edge of fuller exploration and discovery. In their unusual chords and harmonies and occasional evocations of “night moods,” especially as Eder presents them, these pieces give us a clear impression of how Bartók, the newest of the world's great composers, would soon develop. Without doubt Béla Bartók (1881-1945) is Hungary's greatest composer of the twentieth century. Zoltán Kodály, true, runs him close; and though both were instrumental into putting Hungarian folk music on the map, Bartók's uncompromising and often daring language must be regarded as the true trailblazer of the Magyars' musical heritage. The selection of piano music on this disc illustrates the composer's brilliant use of folk melody and its integration into highly original and innovative works for the keyboard. In 14 Bagatelles (1908, revised 1945) Bartók rejected the style of Liszt and Strauss in favour of a wholly austere sound world stripped of all unessential decorative elements and using only the most restricted technical means. The 2 Romanian Dances are Bartók's first set of piano pieces based on that country's folk music and, although awkward technical challenges abound, both dances are vigorous, exuberant and filled with scherzo-like elements.The 15 Hungarian Peasant Songs (1914-18) are one of the composer's most accessible collections consisting mostly of short, straightforward songs. With the exception of No 15, they all contain one idea per song and their duration is brief, but in general the mood is bright and jolly and, being organized in regular phrase units, this set makes for some relaxed listening. Improvisations on Hungarian Peasant Songs (1920) is a collection of eight short pieces each focused on its own simple folk tune repeated several times with variations. In these pieces Bartók went to the limits of folk tune accompaniments; indeed, as the composer changes the harmonization, pitch, dynamics, character and articulation the pieces grow ever more complex, both individually and in the set as a whole. The 6 Dances in Bulgarian Rhythm (Nos 148-153) from Mikrokosmos Volume 6 are the culmination and very last compositions of short works begun as a piano method for Bartók's son. Written between 1926 and 1939, these wild and jazzy dances are tightly organized, and abound with imitation, the clever use of motives at different pitch levels, and the employment and characteristics of counterpoint. American pianist Terry Eder despatches this difficult repertoire with great rhythmic vitality and expressive exuberance, and her performances are consistently lucid and commanding, shedding light on Bartók's irrepressible genius of turning simple tunes into great works of art. A generously filled issue in classy presentation and superb sound quality that should whet the appetite of many a pianophile.